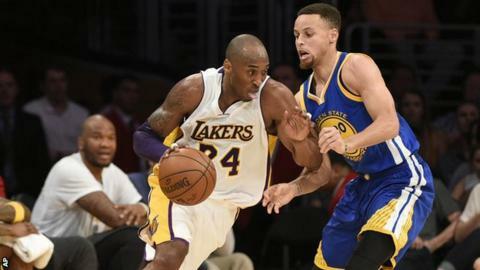 Basketball fans are paying up to $27,500 (£19,315) to see Kobe Bryant's final game for the LA Lakers. Bryant, 37, the third-highest scorer in NBA history, will bring his 20-year career to an end when the Lakers face Utah Jazz in Los Angeles on Wednesday. At the same time, defending champions Golden State Warriors will be going for a record 73 wins when they host Memphis Grizzlies in Oakland, California. Resale tickets for that game are going for up to $15,900 (£11,155). The Warriors are looking to break a record set by Michael Jordan's Chicago Bulls in 1995-96. The game is a 19,595 capacity sell-out with tickets only available via the resale market. Tickets via official channels start at $336 (£236) and rise to £15,900 for courtside seats on resale websites such as Stubhub. Only resale tickets can be bought for the Lakers' game at the 18,118-capacity Staples Center too, with prices fetching between $700 (£491) and $27,500 for the chance to see 18-time all-star and five-time championship winner Bryant for a final time. The Lakers have issued a fraud alert to fans warning them to only buy from their official ticket exchange, where fans can resell tickets securely. However, buyers using the official exchange can still expect to pay up to $10,000 (£7,000) to see the game. The greatest basketball finish ever? Read more on NCAA: Is this the greatest basketball finish ever?